Though early work was done on coaxial carbon cylinders called multi-wall carbon nanotubes, the discovery of smaller diameter single-wall carbon nanotubes in 1993 which are cylinders of carbon atoms one atomic layer in thickness greatly stimulated theoretical and experimental interest in the field. Other breakthroughs occurred with the discovery of methods to synthesize. The electrical properties of carbon nanotubes are dependent upon the orientation of the lattice. The lattice orientation is given by two parameters (n, m). The image to the right shows how the n and m orientations relate to the longitudinal axis of the nanotube and the rotational axis. Scientists continue to explore carbon nanotubes and their many uses while simultaneously utilizing the beneficial properties and working to improve techniques. There is a wealth of other potential applications for buckytubes, such as solar collection; nanoporous filters; catalyst supports; and coatings of all sorts. There are almost certainly many unanticipated applications for this remarkable material that will come to light in the years ahead and which may prove to be the most important and valuable of all. 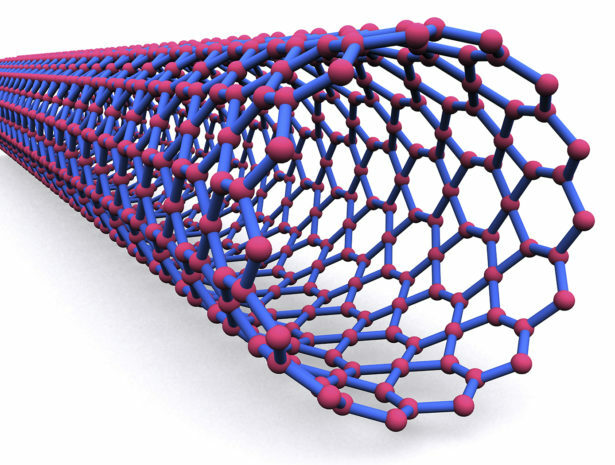 A carbon nanotube (CNT) is a miniature cylindrical carbon structure that has hexagonal graphite molecules attached at the edges. Carbon nanotubes (aka CNTs) are made from graphene sheets consisting of a single atomic layer of carbon atoms in a honeycomb framework that can be rolled into a tube measuring about a nanometer, or one billionth of a meter, in diameter. Carbon nanotubes are also known as “Buckytubes” because they resemble R. Buckminster Fuller’s geodesic domes. Multi-walled nanotubes (MWNTs) were first used as electrically conductive fillers in plastics. Today, they are also used to enhance fiber composites. Examples include wind turbine blades and hulls for maritime security boats. By 2005, 50% of lithium batteries incorporated carbon nanofibers, which are wires spun from CNTs. Carbon nanotubes are even being used to enhance sporting goods like tennis rackets, baseball bats, and bicycle frames. Each type of carbon nanotube has a specific purpose, as some bind to certain cells while others serve as engineering tools. In comparison to other elements, building materials and even different types of carbon, the nanotube form is the strongest, has the highest specific density, electrical and thermal conductivity, and is the most resistant to tension. One of the most important properties of a nanotube is its varying thickness, length, layers and helicity, as these characteristics establish the structure, and therefore, the electrical traits of the molecule. One of the major applications of carbon nanotubes is in cancer treatment, as the molecule could possibly assist in two very different ways. Nanotubes are responsible for identifying proteins associated with oral cancer and can do so in just one hour. As for technological uses, nanotubes are creating lighter, thinner televisions with better picture quality. Carbon nanotube (CNT) is an ideal candidate material for bulletproof vests due to its unique combination of exceptionally high elastic modulus and high yield strain. The nanotube thread can be woven into an incredibly strong cloth, which could be used to create body armor. Professor Windle, one of the researchers involved, says that “our fibre is up there with existing high-performance fibres such as Kevlar”. In fact, the fibre has demonstrated many properties that are a significant improvement on those of Kevlar. The researchers say that their fibre is already several times stronger and stiffer than the best modern alternatives. The usefulness of the nanotube fibres lies not just in their strength, but in their ability to absorb and distribute impact. Carbon nanotubes probably aren’t going to be our material solution for a space elevator, because apparently even a minuscule (read: atomic) flaw in the design drastically decreases strength. Researchers at the Hong Kong Polytechnic Institute figured out that even a single atom out of place in the structuring of a carbon nanotube reduces the strength of the structure by dozens to factors. Carbon nanotubes could be, at least hypothetically, a possible material for construction of a space elevator cable.